Biamp Devio is a great collaboration tool designed for conferencing in small-medium room spaces. The Devio device is purpose built for soft codec conferencing. 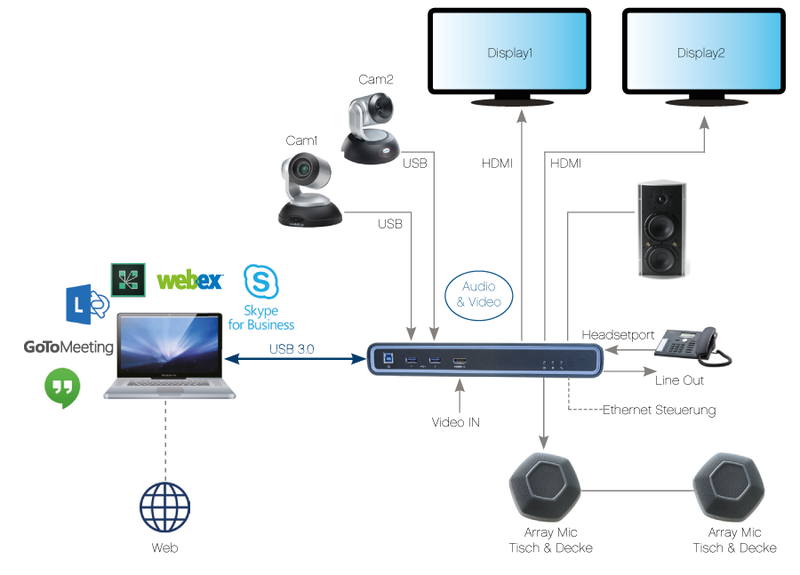 A soft codec allows for audio and audio-video distance conferencing to occur through a web interface, downloadable software application, or some combination of these. The Devio is truly unique as it acts as USB hub, Digital Sound Processor and Display outputs over USB. It has an auto setup feature, making installation and calibration quick and easy. 2 HDMI outputs for Dual monitor support. Video can be sent to the Devio via an HDMI connection for single display support/pass-through, or can be sent to the Devio via a USB 3.00 connection. Requires DisplayLink drivers on your PC/Laptop for Dual Monitor support. Devio will support a maximum of two beam-forming Microphones which provide crystal clear audio capture. The microphones come in either tabletop or ceiling versions. The Devio has in built audio processing capabilities which include Automatic Gain Control and Acoustic Echo Cancellation which means that your PC/Laptop does not have to deal with these two processes. The Devio also acts as a USB hub, with USB connections for HID’s and USB cameras. HD PTZ USB cameras will allow crystal clear video to be captured and sent to the far side participants. The Devio also provides 2 audio outputs. 1 x amplified and 1 x line output. Speakers can be connected directly to the Devio. If greater sound re-enforcement is required, the Devio can be connected to an amplifier. Lastly, the Devio has a telephone input. By connecting a VOIP phones headset output to the Devio, users can even do tele-conference calls through the Devio. Installation was quick and easy. Video and audio was fantastic. A Unique product on the market at the moment. Warren is AVC’s Solutions Architect and has worked in the Audio Visual Industry for over 5 years. more of a question… can audio pass through the hdmi outputs and be heard on the tv monitors or do you have to use the audio outputs? The HDMI input/output is a pass through connection. Whatever audio is in the HDMI source signal will be sent to the display. The audio from the Devio is not embedder on the HDMI signal.